By Dennis W. Viau; modified from a cookbook recipe. This rice substitute works well in a keto diet. It is low in carbohydrates, only 1 net gram per serving (according to the author of the cookbook). The flavor and texture are excellent, making this suitable for recipes that call for plating “on a bed a rice.” I like it best with my sautéed lamb. 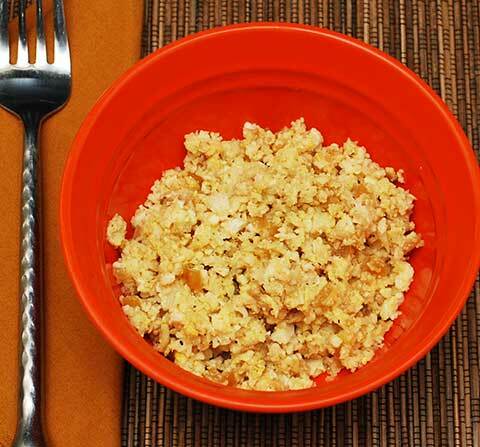 Place the cauliflower in a food processor and pulse until it resembles grains of rice. Heat the oil in a large skillet over medium-high heat. Add the onions and sauté for 3 to 4 minutes, until tender and translucent. Add the garlic and sauté for another minute. Add the riced cauliflower, tamari, optional fish sauce, salt, and pepper. Blend. Reduce the heat to medium and cook for 5 minutes, stirring occasionally. Add the egg and stir until the egg is completely cooked, about 3 minutes. Adjust for seasoning.